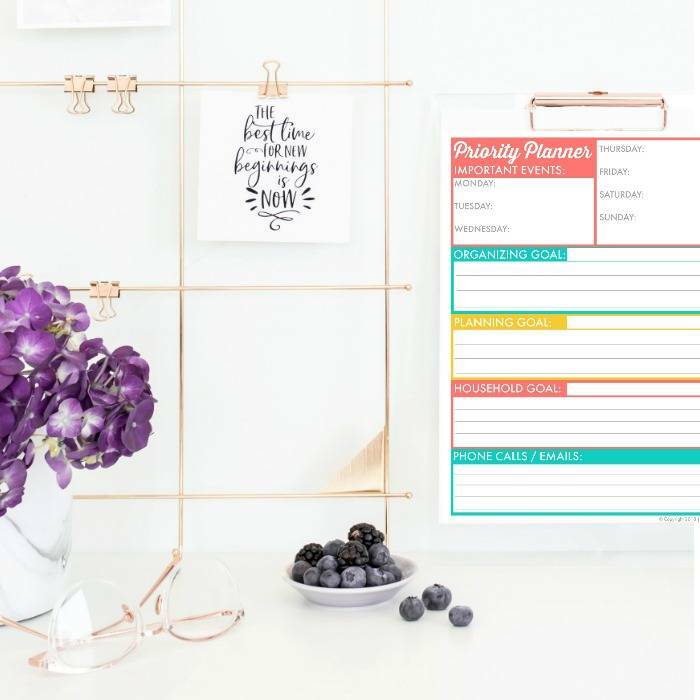 Download this FREE Printable Priority Planning Worksheet For Organizing Your Life and priorities your Goals for your Household, Organizing and To-Do List. One of the things I love about spring is getting organized and getting things cleaned out! That’s exactly what the FREE Printable Priority Planner is for! I just love that fresh feeling when you walk into a de-cluttered home! It’s something that brings peace to our home but also gives us some sanity as we head into the summer months when the kids are home and life is a full of activities, vacations and parties with friends and family! If you’re not careful, getting organized and cleaning out can seem OVERWHELMING! If I’m being honest I rarely have time to get it all done in one setting, Spring Cleaning isn’t a 2 day task and then you’re done around here, it’s more of an ongoing process that I have to fit between Basketball Tournaments, Softball Practices, Dance Rehearsals and more! One thing I learned about 3-4 years ago that’s been Life Changing is to simplify my task list. I used to make a list a mile long of things I wanted to get done only to get overwhelmed and never accomplish anything. Once I reduced my to-do list I actually accomplished more. It seems counter-intuitive but reducing my to-do’s forced me to focus my priorities! That’s how the Priority Planner was born! I wanted to have focused, achievable goals each week so that as I Had time I could accomplish those things that are the most important to me! Now when I have an hour, or an evening at home, or a Saturday afternoon after basketball games I know exactly where to start! I know exactly where to dive in and get started to acomplish my goals. This isn’t really your calendar or daily hourly schedule, it’s a big picture look at your week. What important (Outside of your normal) Activities are going on that you need to be planning and preparing for. It’s a good idea to have these in your mind, this will help you plan and prepare. I like to pick one area, maybe 2 at max that I want to organize and clean out. It might be the Kitchen Junk Drawer, the Hall Closet, Your Bathroom Drawers, A Kids Closet or Toys. Just pick one or 2, focus on something that you can accomplish this week, something attainable. Being realistic with these goals will really help you see results! If you just did one major area a week, you’d start to see and feel real progress in just a few weeks.NOTE: There are some areas in our home that stress me out when they get dis-organized, start with those areas. For example, my office is somewhere I spend a lot of time, when it starts to get cluttered it’s mentally overwhelming to me so I like to focus on those areas first. Do you have an upcoming Vacation, Need to Book your Kids Summer Camps, Decide on a New Vacuum Cleaner. What are those research/planning related tasks that need to be done. Pick one and make it the priority this week. You might only have 30 minutes here and there, but you can knock that goal out by making it the priority and getting it done. Then Next week move on to the next topic. Planning Ahead makes life less stressful when those events get here, It will simplify a lot if you just take some time each week, focusing on planning rather than always chasing down deadlines. This is where I like to keep what are more typically weekly or common chores. Folding and Putting away laundry, Meal Prep, Washing the Sheets, etc. These are the things I can accomplish in 15-20 minutes, but having them in a list format helps me to prioritize and know exactly what needs to be done next.One of the ways I simplify my household routine is by using Grove Collaborative to Shop for Natural Cleaning Products that help me keep my home organized and clean! Almost weekly I have phone calls or appointments I need to schedule, people I need to email back, etc. I keep my personal list separate from my work list, so I like to have a task list for those things that need to be done. Often these are things I can do in car line, while I’m sitting at Basketball Practice and more. If needed write down the phone numbers or email addresses when you make your list so you have everything you need in one place! Choose One And Get it Done! This is where you put it into action! Taking 15 minutes a week to sit and prioritize your week is so important, after that you’re ready to start accomplishing your list! Everytime you have 20 minutes to an hour or two take a look at your list, choose one and then get it done! You will start to feel the progress and forward movement towards your priorities! This Focus on those items and mark them off your list so you can move on to the next one. Try not to add to your list, if it can wait write it on the back of your paper so you can add it to your priorities for next week! This list is a great way to keep yourself on task, I find that I am great about coming up with lists of things to do, but sometimes I struggle getting the most important things done first, because it’s so easy to jump from thing to thing and never actually finish something! If you have tips and tricks for prioritizing your life, I’d love to hear them! Leave a comment below and let us know! Don’t Forget! Right now when you place your first $20 or more Grove Collaborative Order you’ll get $30 worth of FREE PRODUCTS! Including a FREE Mrs. Meyers® Hand Soap, FREE Mrs. Meyers® Dish Soap, FREE Mrs. Meyers® Multi Surface Spray and FREE Dish Cloths! That’s an amazing value! Over $30 in FREE Products including FREE Mrs. Meyer’s Products and some of the best selling Grove Collaborative Items for you to try when you join today! Freebie hunters, you are gonna LOVE this! There are 17 FREE In Store Deals this week! These are available at all kinds of places like Walmart, Target, CVS, and all our other favorite places to shop. Most of these deals run through 04/27 but stores like Dollar Tree and Walmart stay pretty consistent on their pricing. You may be able to get the deals at those places all the time as long you have your coupon ;) Check out all of the Printable Coupons we have available. FREE + $0.22 Moneymaker after coupon and rebate! FREE after coupons and rebates! The Children’s Place Sales are the best way to save money on your clothing purchases! I have all of the best deals, cheapest prices, and The Children’s Place Coupons right here! I know that I am always looking for good deals on clothes for my kids, and if you are on the hunt for The Children’s Place Sales, this is the place to look! Check back here any time you want to find the best prices on Children’s Place Clothing or The Children’s Place Coupons! If you haven’t heard, you can earn My Place Rewards which will add up to more savings on future purchases at The Children’s Place! For every dollar you spend, you earn 1 rewards point and for every 100 points, you get a $5 Reward to use on your next order. Sometimes they even offer double or triple Place Cash which can REALLY add up! Make Sure you join the My Place Rewards Program! It’s Free to Join! Wow! This is the time to grab new clothes for the kids for spring and summer. Right now, you can get up to 60% off at The Children’s Place! There is also FREE shipping every day with NO minimum, so you can score some awesome deals! This ‘Gentleman In Training’ Mustache Graphic Bodysuit is too cute and perfect for all the baby boys! This is on sale for $4.99. Dinosaurs are really popular, and all the boys will love this fun Dino Graphic Tee. Get this for $5.99. How cute is this Girls Sleeveless Knit Cut Out Skater Dress?? I love the crisscross on the back, and I know this is one my daughter will love. This is on sale for $11.87. Do your boys need new shorts? These Boys Striped Woven Shorts are perfect for spring and are priced at just $13.97. Don’t miss out on getting up to 60% off at The Children’s Place! Here’s a great way to get some FREE money to spend on your kids’ clothes! Through 4/21, you’ll get a FREE $10 bonus card with the purchase of $50 or more in gift cards to The Children’s Place. If you use your clothes money to buy gift cards, you’ll end up with the free bonus card – an extra $10 bonus card for free to spend! I love taking advantage of these deals to help me stretch my money a little further – especially with kids’ clothes because the kids outgrow them so quick! Here are the Bonus Card Terms – Valid April 22 – May 27, 2019 in U.S. and Puerto Rico stores and online (excluding shipping to Canada) only. One-time use only and one bonus card per transaction. Discount applied after other applicable discounts and before taxes/shipping fees. Make sure you don’t miss out on this FREE $10 bonus gift card deal! Take a look at all of the Children’s Place dales going on because there is a LOT more! The Children’s Place® is a trademark of The Children’s Place. CVS® Ad Preview & Shopping List! I have a list of all of the best deals you can get at CVS® coming up next week! Gather up the coupons you will need and learn all about the Extra Care Bucks Deals that make the cheapest prices! I’ve been going through the 04/28/19 CVS® Ad Preview pulling together the best deals going on next week and I’ve got a Huge list of deals for you using coupons, Extra Care Bucks rewards, and more. Make sure you print your coupons now before the coupons reach their limit and be ready to shop first thing Sunday morning because the best deals sell out fast. $1.13 ea. wyb all 7 after coupons and ECB! $2.83 ea. wyb 3 after coupons and ECB! $2.48 ea. wyb all 6 after coupons and ECB! $1.66 ea. wyb 3 after coupons and ECB! $2.74 ea. wyb both after coupons and ECB! $2.09 ea. wyb 2 after coupons and ECB! $1.54 ea. wyb 2 after coupons and ECB! $2.12 ea. wyb 3 after coupons and ECB! $3.97 ea. wyb all 4 after coupons and ECB! $3.14 ea. wyb both after coupons and ECB! $4.49 ea. wyb both after coupons and ECB! $4.64 ea. wyb 2 after coupons and ECB! $5.16 ea. wyb all 3 after coupons and ECB! $6.24 ea. wyb 3 after coupons and ECB! $5.66 ea. wyb all 3 after coupons and ECB! $5.49 ea. wyb 2 after coupons and ECB! $6.98 for Sally Hansen Miracle Gel + FREE Hard As Nails after coupons and ECB! CVS® is a registered trademark of CVS Pharmacy, Inc.